Acidic Slime is such versatile removal and leaves you with a 2/2 that will trade with someone's best [and likely much bigger] creature because of the deathtouch, plus consider that if you have Thantis, the Warweaver in play, your opponents will be attacking each round and you are the likely target because of the spider. 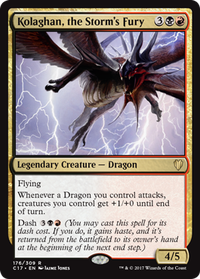 Harrow has great synergy with this commander and landfall in general, the fact that it is an instant puts it over the top as it combos with Rampaging Baloths for 2 surprise 4/4 blockers. Sheltered Thicket and Canyon Slough . 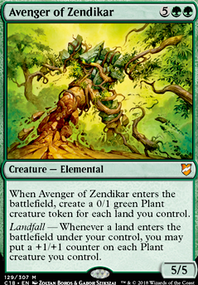 Not too expensive, can cycle for card draw in a pinch without your commander out and then be brought back into play with his -3 plus they have the Swamp/Forest/Mountain type [subtype?] that lets them be fetched with Farseek though Wood Elves / Nature's Lore will only fetch the Thicket. You can always splurge on the relevant shocklands to round out the cycle. I would also swap out the 'Refuge' lands for the appropriate guildgates so Circuitous Route can do better color fixing for you. Farhaven Elf might want to become District Guide for the same reason but you do lose getting the land in play. Comet Storm is an upgrade to Volcanic Geyser as it gives you the choice of burning multiple target at the same instant speed. 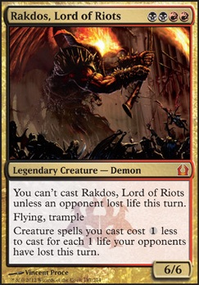 Omnath, Locus of Rage could definitely find a nice home in this deck as well. Not quite as budget as Multi, but I tried to keep suggestions under $5. Nature's Lore , Farseek and Skyshroud Claim can grab Smoldering Marsh , Cinder Glade , Canyon Slough and Scattered Groves . 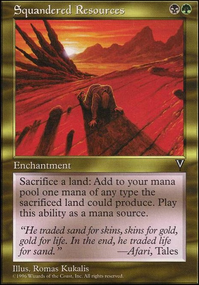 I would recommend swapping out Painted Bluffs , Memorial to War , Warped Landscape , Zhalfirin Void for those four lands. Llanowar Wastes and Dakmor Salvage are also great. 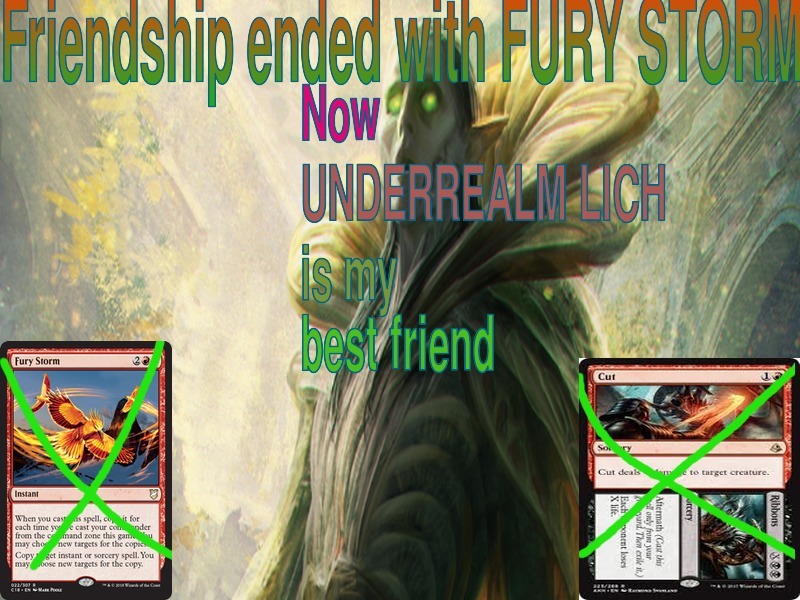 After some more testing it has confirmed that Fury Storm simply will not cut the mustard in the deck. Now it is time to try something fresh: Underrealm Lich . Now this presents a very powerful avenue for card selection and graveyard filling, however presents a challenge in that you may possibly deck yourself as the deck has no ways of shuffling the graveyard into the library. While I haven't yet had any issues with potential decking yet, it's always better to be safe than sorry. The first thing that came to mind was Elixir of Immortality , or simply putting in one of the eldrazi titans to provide more reliable (but less predictable) anti-mill but honestly in the colours present the options are rather limited. Another possiblity was Struggle / Survive which is fairly cheap and offers instant speed removal for a fair amount of damage along with a cheap shuffle effect. I've since gotten my hands on a Cabal Coffers so that is going into the deck, replacing Canyon Slough . 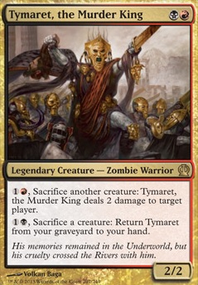 Often the amonkhet cycle lands feel worse than the single mana cyclers like Forgotten Cave or Barren Moor and all too often have ended up being discarded to an uptick of Lord Windgrace , who doesn't care what kind of land you discard at the time. After more testing, Winding Canyons has not been the game changer that I had hoped, but I will give it a few more shots before completely discarding it from potential upgrades. Vampiric Tutor in place of Cut / Ribbons has been one of the best quality of life improvements to the deck in a while. One final thought is whether or not adding Retreat to Kazandu to the maybe board is worth it. The deck can burn through life surprisingly fast and without finding a Zuran Orb you can end up playing on the backfoot the entire game. If anything it voids the first lot of lifeloss from Glacial Chasm and works great with Splendid reclaimation or Scapeshift . If anyone has any thoughts on the matter, let me know!